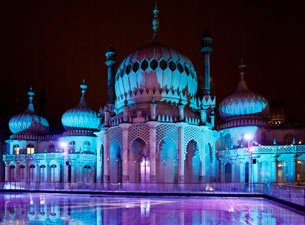 The Pavilion in Brighton has opened its ice skating rink for another year. Come and enjoy the ice until the 20th January, where you can skate between the times of 10am-10.15pm. At peak times tickets cost £13 for adults, £8.50 for under 12s and students, or £34 for a family ticket. At off peak times, tickets are £10 for adults or £7 for under 12s. Children under eight, who need a bit of support can skate away with ease with the help of penguin aids, which are provided on a first come, first serve basis. After your skating session, head over to the bar and experience a fabulous feast with recipes from celebrity chef, Jamie Oliver. His menu includes winter warming stews, vegetarian dishes, savoury snacks, chocolate & chestnut brownies, and other treats. All the meals are available in adult and child portions.